Thrive Thursday Placeholder for August 7: A Blog Hop of Excellent School-Age Ideas! I'm excited to be hosting the Thrive Thursday roundup of school-age programs and ideas for August. Thrive Thursday is all about programming for the school-age children we serve. It's a place for librarians offering programs to share what they've done and/or find new ideas. It's a place for those of you who don't currently get to experience the joys of school-age programming to dip your toes in the water and share in the fun. It's a most excellent resource. Want more info about Thrive Thursday? Check out Lisa Shaia's blog (she's the idea genius behind this whole shebang), and don't forget to check out the Pinterest board and Facebook group, too. So many places to find great school-age ideas! If you'd like to participate in the August Thrive Thursday blog hop, all you need to do is post a link to and brief description of your school-age program in the comments of this post. If you don't have your own blog and want to write up your program to share via Thrive Thursday, send me an email at amy.e.koester(at)gmail.com so you can guest post here on The Show Me Librarian, then share your link that way. Many options! Just make sure you share a link to your program in the comments of this post by the end of the day August 7. The recap post will go live shortly thereafter. I cannot wait to see what strange and wonderful school-age programs you all have to share! I learned some great new rhymes and songs at the Guerrilla Storytimes that took place at ALA Annual in Las Vegas, including a few that immediately struck me as fun fodder for felt versions. And thus today's felt story was born. He had bubbles in his throat! 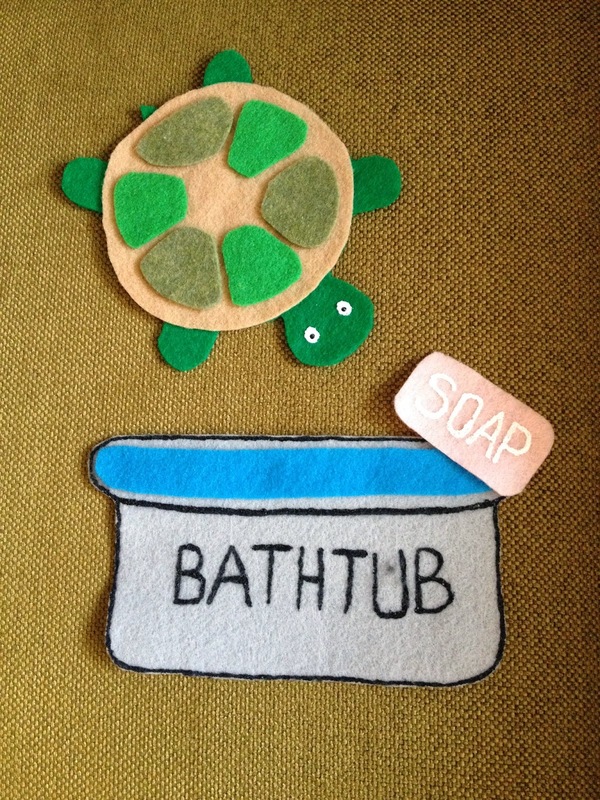 When I put the felt rhyme to use in storytimes, I first ask questions to help the kiddos identify the felt objects before I tell them what they are. Then we'll do the rhyme a few times, making exaggerated slurping and chewing noises when Tiny Tim ingests rid of the bath water and soap. We'll do the rhyme a few times, and on the last time, I blow bubbles using a small bubble container I've concealed behind my lap-size flannel board. What a surprise! Today I'm over on The Library as Incubator Project with my final post in my guest Show Me STEAM series. 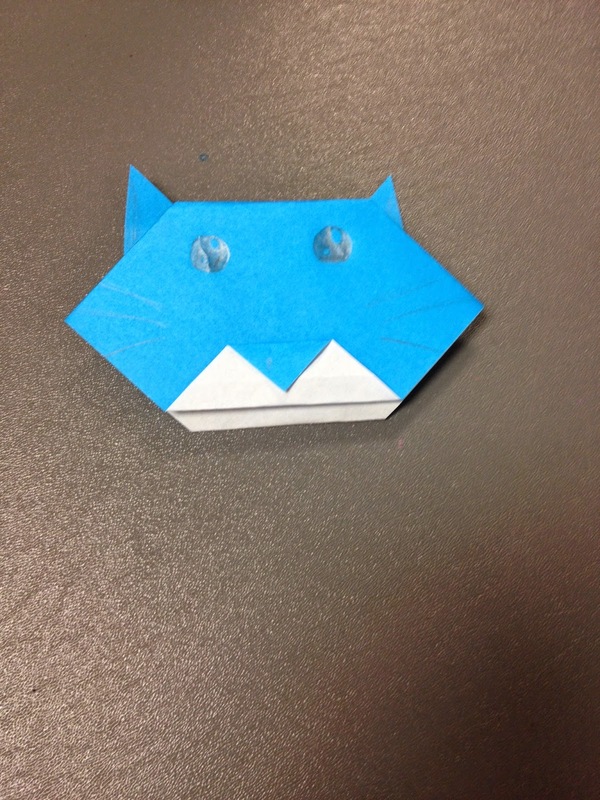 Have you been looking for ways to incorporate a bookmaking activity into a program? Have you ever thought of giving that book a STEAM purpose--say, to guide in stargazing? 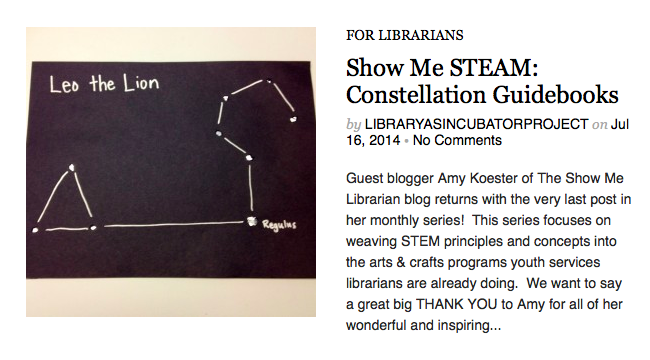 I'm sharing a constellation guidebook STEAM activity over on The Library as Incubator Project, and I hope you'll head over there to check it out. Thanks so much to the great moving and shaking folks at The Library as Incubator Project for allowing me to be part of their outstanding blog these past six months. I've loved getting to share these programs and activities with a wider audience, especially one as cool as the LAIP's readership. It's been a busy summer at the library. That's just the way we like it: a dance of activities ranging from summer reading to exciting STEAM/maker programs to featured performers to special after-hours events and beyond! 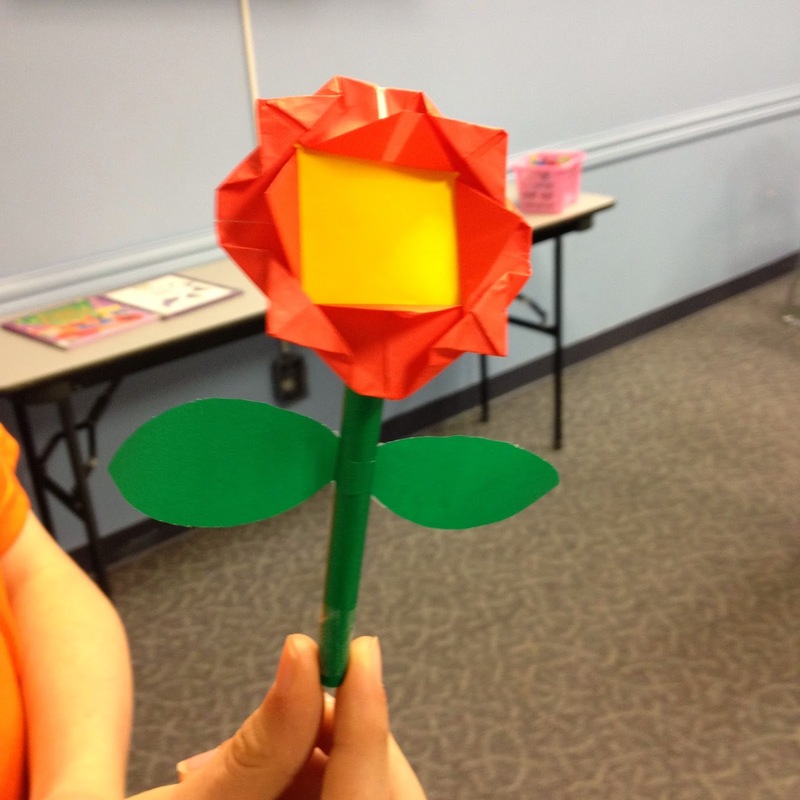 I want to share what we were up to last week at the library. We offered two particularly exciting events, which I want to share here with Vines and links to full how-tos and program write-ups. I hope your summer has been this fun so far, too! I had about twenty school-age kids and their caregivers in the library last week to make Art Bots, fantastically simple but incredibly amazing drawing robots. Be not afraid, oh ye with fears of robotics and/or maker activities. These little bots are actually very straightforward, and my kiddos caught on to their construction really quickly. I used this excellent program write-up from the Cheshire (CT) Public Library as I prepped for the program. 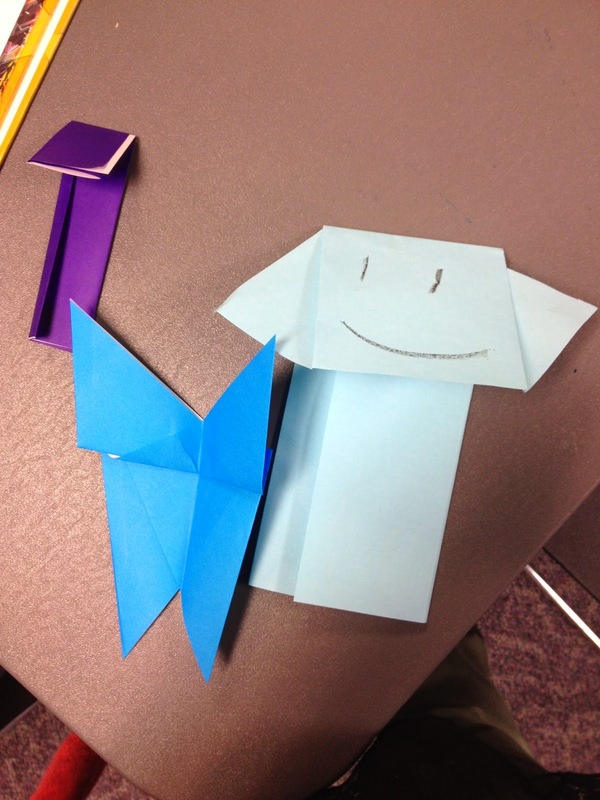 I first heard about this program from Marge at Tiny Tips for Library Fun, and I first offered it (and blogged about it) at my own library this past winter. It's been a repeat hit during the summer months, too, with a great balance between families new to the program and those who are repeat attendees. The whole event is a treat: getting to be in the library after hours, the construction and use of reading forts, and--the finale--glow in the dark hide and go seek. So. Much. Fun. 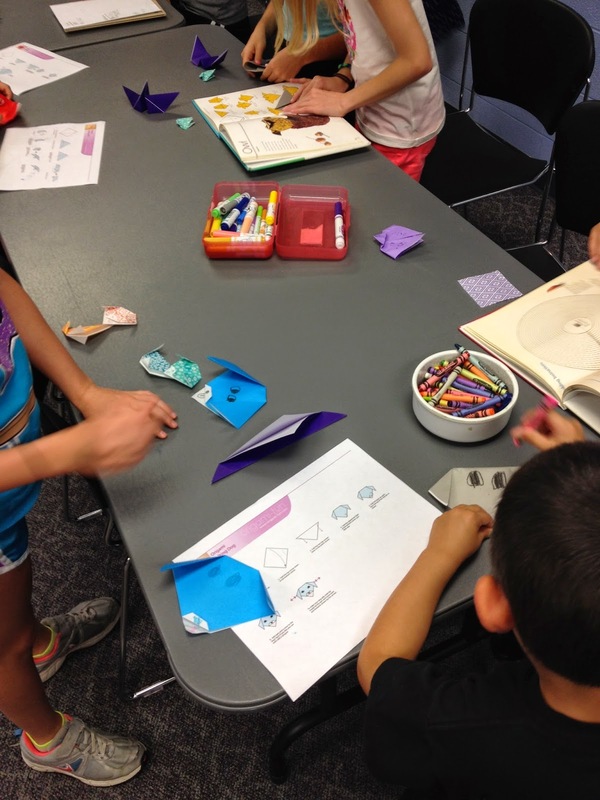 I'm over on the ALSC Blog today talking about the variety of community resources that libraries can tap to offer interesting and engaging STEM events. For example, have you checked out your local museums' outreach education departments? What about contacting the local garden or astronomy club? 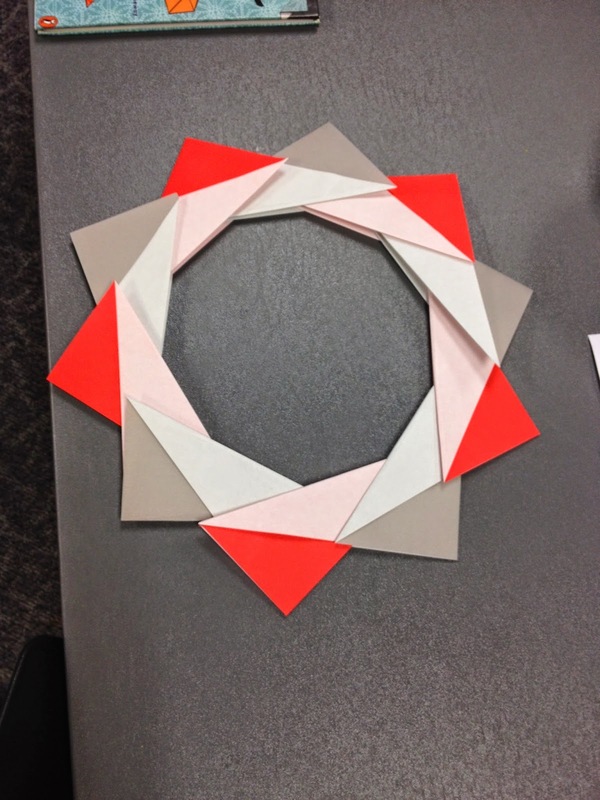 Find these and other resources on my ALSC Blog post, and make sure to share your own go-to STEM community resources in the comments over there. I got home from the 2014 ALA Annual Conference in Las Vegas on Tuesday evening, which means I've had some time to go over my notes and think about my biggest takeaways from some of the conference sessions I attended. As has become my habit, I wanted to share them here in hopes that we can maybe have some discussions (here, on Twitter, etc.) to think about these concepts even more. My takeaways follow. Teen volunteering doesn't have to be limited to the physical library space to bring benefit to the library. The Mission Viejo Library offers teens a virtual volunteer opportunity: creating content for their Teen Voice blog. Teens earn their service credit by writing a certain number of pieces for the blog each month, and these can range from book reviews and lists to author interviews and beyond. I love this idea of a virtual volunteer experience for teens for two big reasons. One, because not all teens are able to get to a physical location with consistency, which is a general requirement for in-library volunteering. Second, because it can be really tough to provide enough volunteer tasks to meet the demand of teens who need service hours. Bonus: teens are getting experience writing for a formal outlet, creating a portfolio that can help them in future endeavors. This concept was shared specifically in the context of an IMLS-backed training system that is in development, but it resonates far beyond just that instance. We can do more with less strain on any individual partner when we collaborate, and the fact that collaborations prove that time and time again is a strong argument for collaboration being the rule, not the exception. Make collaborating your default mode and see how far you can go with your ideas and initiatives. Offer varying types of programs for different types of customers. At the Carnegie Library of Pittsburgh's Labs, programs take one of two formats: programs centered on learning and practicing specific skills at the instruction of "expert" mentors; and programs centered more on exploration and experimentation with equipment and skills, with input from peers also utilizing the space. This model allows them to reach customers with both specific and casual interests. I'm thinking what that philosophy looks like for children's programs. When is storytime the best option, and when is a more free-flowing, self-directed family event a good alternative? What's a good balance between scheduled school-age programs and passive activities? This concept asks libraries to consider their customers and how they use the library, then provide access pathways for them to be able to interact in programs that will be meaningful to them. I'd love to hear some of your biggest takeaways from #alaac14! This past weekend, I attended the 2014 ALA Annual Conference in Las Vegas. 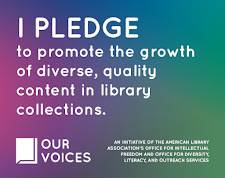 I attended in multiple capacities--as a member of the 2014 Newbery Committee, as the incoming chair of the ALSC Public Awareness Committee, and as a staffer at my library looking for professional development. I also had a few opportunities to present and contribute to sessions, which I'd like to share here. The term "makerspace" seems to be on everybody's tongue, but more often than not, we hear "makerspace" and think high-tech, like 3D printers. And while 3D printers are great, they aren't the only want to do a makerspace. Fellow advocate for the maker mentality Claire Moore and I talked about some of our successful low- and medium-tech maker activities, easily adaptable by libraries with any range of budget and space. Justin Hoenke also participated virtually, as he couldn't attend the conference live, to talk about what's happening with making in Chattanooga--especially their partnership with Dev Dev. Check out our slides and Justin's video below, then head over to our Pinterest board for full info on the maker activities we mentioned. I co-facilitated four (!) Guerrilla Storytimes in the Uncommons space throughout the conference, and the idea-sharing that occurred in these sessions was sensational! Head over to the Storytime Underground site for full recaps, which will include videos. Mary Ann Scheuer, Aly Beecher, Cathy Potter, and Louise Capizzo recently asked me to join their library blog initiative Common Core IRL, a project to assist teachers, librarians, and caregivers in demystifying what Common Core means for their kids' nonfiction reading. These four put on a program session delving deeply into this topic in Vegas, and while I couldn't be present due to a conflict, I heard outstanding things about their program. I did a bit of help looking over their slides, and I wanted to post the presentation here, too. You can find lots more information on the presenters' blogs.